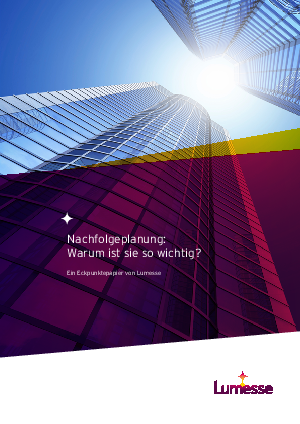 Home > Lumesse > Nachfolgeplanung: Warum ist sie so wichtig? Succession planning – the process of identifying and preparing successors for critical positions within your organisation – is identified as one of the top three focus areas for today’s HR departments. But succession planning is also amongst the most difficult aspects of talent management to implement and measure. As a result, many organisations either ignore it or simply fail to implement it. This paper looks at the other end of the supply chain, the retention, motivation and development of the successors to key roles in your business. Download now to understand why it's crucial for organisations to develop a clear strategy for career and succession planning tied to a total talent management programme.